hrek The Musical, based on the Oscar winning DreamWorks film that started it all, brings the hilarious story of everyone's favourite ogre to dazzling new life on the stage. In a faraway kingdom turned upside down, things get ugly when an unseemly ogre — not a handsome prince — shows up to rescue a feisty princess. Throw in a donkey who won't shut up, a bad guy with a short temper, a cookie with an attitude and over a dozen other fairy tale misfits, and you've got the kind of mess that calls for a real hero. Luckily, there's one on hand… and his name is Shrek. Shrek The Musical opened at the 5th Avenue Theatre in Seattle in August 2008 and premiered on Broadway in December. Directed by Jason Moore (Avenue Q) and choreographed by Josh Prince, the production featured Brian D’Arcy James (Next To Normal, Dirty Rotten Scoundrels), Sutton Foster (Little Women, Anything Goes), Christopher Sieber (Spamalot, Thoroughly Modern Millie), John Tartaglia (Avenue Q, Beauty and the Beast) and Daniel Breaker (Passing Strange, Cymbeline). At the time, it was the most expensive musical to open on Broadway. Shrek The Musical closed on January 3, 2010, after running for 441 performances. It was nominated for eight Tony Awards, including Best Musical, and won for Best Costume Design. Shrek will be played by CSOPA veteran Jonathan Woyke, Princess Fiona by Brittany Clough, and Donkey by newcomer Rocky Riobo. Caylen Braun will take on the role of the diminutive Lord Farquaad, while Meghan Mindel breathes fire as the Dragon. Young Fiona and Teen Fiona will be played by Madalyn Clempson and Hailey Bate, while Melynda Barson will portray Young Shrek. Playing Thelonius the Executioner will be Mark Wiens, while Conrad Loeppky takes on the Captain of the Guards. The Three Blind Mice Trio will consist of Avianna Clempson, Hannah deNevers and Kessia Warren, while the German Pig Trio has Maxwell Glover, Josh Robinson and Sebastian Warkentin-Scott. Rounding out the Fairy Tale Creatures are Andrea Arce, Hailey Hanson, Kirsten MacDonald, Shareena Malhi, Olivia Moniz, Rachael Olivares, Raven Regino, Adrienne Reitsma, Carmen Sigurdson, Amber Wilbur and Jordan Orto as the cross-dressing Wolf. Andrew Smith is the director, Lisa Zimmer the vocal director, Trischa Buhler the orchestra director, and Shelley Wojcik is the choreographer. Set by Tara Arnett, costumes by Heather Westergard and lights by Jamea Lister. 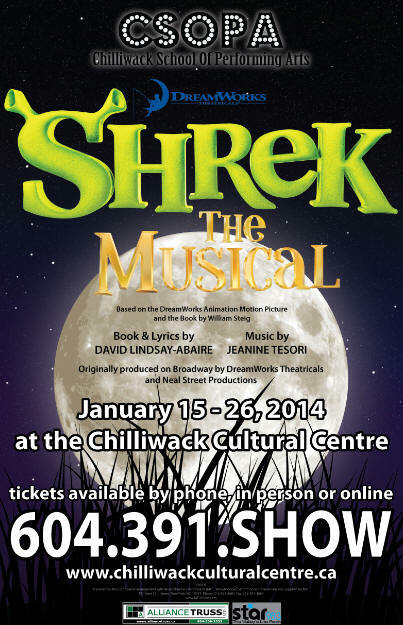 Shrek The Musical previews on January 15, 2014, opens on Friday January 17 and runs until Sunday, January 26. 7:30pm evening performances on January 17,18,23,24,25. 2:00pm matinée performances on January 18,19,25,26. Adults $20, Students & Seniors $15. $9.75 all seats on January 15,16 (evening),18 (matinée) Tickets can be purchased by calling the Cultural Centre box office at 604-391-SHOW (7469). Music by Jeanine Tesori, Book & Lyrics by David Lindsay-Abaire. Based on the DreamWorks Animation Motion Picture and the book by William Steig.